Hailsham was full of festive cheer on Friday as the annual Christmas light switch-on spectacular attracted hundreds to the town centre. Festive entertainment included carol singing from students of Hailsham Community College and Grovelands Community Primary School, leading up to the Christmas lights switch-on. The lucky winners of the Best Christmas Pizza Design competition – Eden Woodgate (5), Dexter Keech (7) and Lee Sharp (9) – pressed the button alongside the Mayor of Hailsham, Councillor Nigel Coltman, to turn on the town’s Christmas lights. 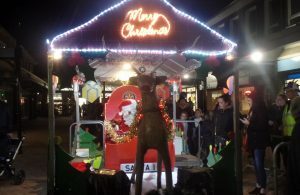 There was also be a candy floss stall provided by Hailsham Lions, and Santa & his Sleigh (courtesy of Hailsham Rotary Club) was in attendance handing out free sweets to children.